It’s summertime which means I can literally start feeding my farmer’s market obsession. What’s popular in your farmer’s market right now? Ours is full of golden, yellow squashes, green zucchinis and pearly white onions. And juicy red tomatoes. My crisper was pretty full before Surya and I [and my dear friend Jason who I unintentionally failed to mention joined us for our trip through the market] took a stroll to the farmer’s market but I couldn’t resist picking up some veggies – all of the ingredients I needed for this summery Vegetable Tian. My sister shared this recipe with me a few months ago, and it’s a hit with Surya. And the rest of the family too. Vegetable Tian is perfect for the summer - try it with any variety of fresh, crisp summer vegetables along with juicy tomatoes. 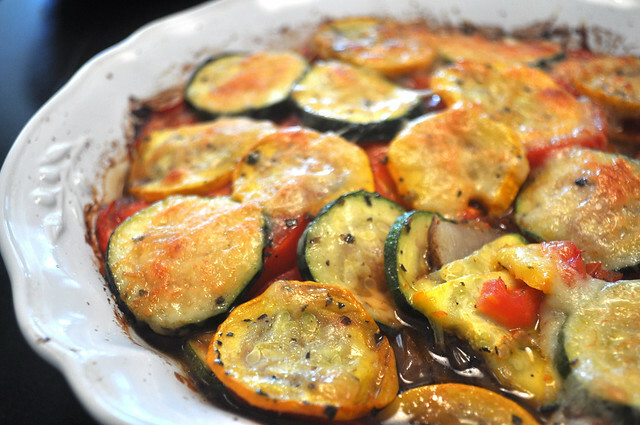 It\'s very light with a hint of nutty gruyere on top, filling potatoes and mildly sweet zucchini and squash. Serve it alone or on top of toasted sourdough bread. Saute onions and garlic in about a tablespoon of olive oil for 5-10 minutes until tender. Thinly slice the potatoes, squash and zucchini. Put the potatoes in a ziplock bag with a generous glug of olive oil, salt, pepper and Italian seasoning. Shake shake shake. Remove to a cookie tray and repeat with the zucchini and squash. You likely do not need to repeat the olive oil. In the bottom of a casserole dish, layer the onion-garlic mixture. Then make a layer of potatoes (they should not overlap), then on top of that zucchini, then tomatoes and then squash. You can do another layer of zucchini and squash with any leftover. Drizzle a little olive oil on top. Cover with foil and bake on 400 degrees for 45-50 minutes or until the potatoes are tender. Remove from oven, shower generously with shredded gruyere and bake uncovered for another few minutes until the cheese is melted. Wow.. that’s one healthy and delicious dish.. Love the colors in the dish. Enjoy your long weekend Nithya. this looks so beyond perfect. i want. Beautiful photos, makes my mouth water! Thanks! Let me know if you try it out.